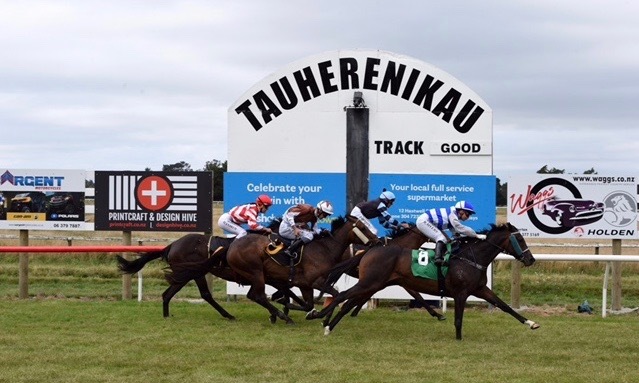 The Wairarapa Racing Club holds five race meetings each year at Tauherenikau. As part of the InterIslander Summer Festival, the two new year meetings of January 2nd and February 6th (Waitangi Day) are major days attracting tens of thousands of happy people. The January 2nd race day is famous for its picnic atmosphere, and generations of families from the Wairarapa and surrounding areas such as Wellington and Palmerston North, and from as far away as Auckland, make the yearly trip to be part of this fun day. There is plenty to do for everyone. In addition to the excitement of the races themselves, kids can take time-out to ride on the train, have their face painted, enter kid’s competitions and also have a bounce around on the many castles and slides in the kid’s entertainment area. Punters have the chance to join together as part of the punters club and a $10 entry sees you in with a chance to share the pool winnings at the end of the day if our guest selector is on song. The Wairarapa Racing Club holds a license that allows patrons to BYO refreshments on January 2nd and February 6th race meetings. An allowance of 6 stubbie bottles of beer OR 1 bottle of wine per person is permitted. This will be strictly monitored by security at the gates. There are also fully licensed bars on site at Tauherenikau. The club provides a pick-up and drop-off service from the Featherston railway station on new year race days. The train leaves Wellington at 9.55am and returns around 5.00pm. All you have to do is to walk-in, walk-out and have a great day at Tauherenikau. The Wairarapa Racing Club holds meetings in January, February, August and October. The Masterton Racing Club holds a meeting here each March. Click here for more information.